Last weekend’s deadCenter Film Festival featured a number of upcoming high profile releases like The Overnight and The Stanford Prison Experiment, but none were as exclusive as native Oklahoman actor/writer/director Tim Blake Nelson‘s Anesthesia. The film has far only screened at the 2015 Tribeca Film Festival before reaching the packed out theater in the Oklahoma Museum of Art which made the one time screening especially unique for Oklahoma. 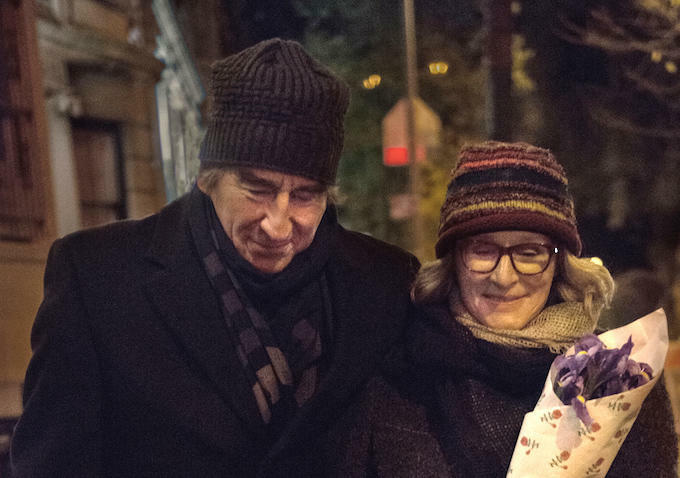 Anesthesia opens with the mugging of Professor Zarrow(Sam Waterston) inside the of his own apartment building. Several characters rush to the scene to find him stabbed with his fate left a mystery. The movie then turns back the clock and follows a number of the people connected to the mugging and follows the stories of their daily lives leading up to the event. The story follows the lives of a recovering drug addict named Joe(K. Todd Freeman) and his friend Jeffrey(Michael Kenneth Williams), a father(Nelson himself) and his cancer diagnosed wife(Jessica Hecht), a man named Sam(Corey Stoll) who is having a secret affair, and one of Zarrow’s own students Sophie(Kristen Stewart) who struggles to come to terms with own reality. Each of these characters wrestle with their roles in the continuously difficult situations life in the twenty first century brings. The film features a sprawling narrative following each member of the ensemble cast as they explore the four corners of New York City. Each supporting character stars in their own their own mini-novel before their connections to Professor Farrow become clear. It works as a very clever way to look at the different facets of the city with each story exploring the differing philosophies, socioeconomics, and difficult hurdles these people must overcome to survive. Zarrow acts as the moral center of gravity by holding each of these lovely and broken individuals together as they go through their own journeys throughout the film. It’s a brilliant use of a non-linear plot structure and is designed to focus on the locale while delivering powerful character driven interactions. Anesthesia is most definitely an existential venture akin Woody Allen’s early work. The movie wrestles with the notions of the “death of God” in the era of technology and mankind’s need to find fulfillment through humanism. Each of the characters are confronted with crisis in one form or another and they all bring their own unique perspective to finding a solution. Kristen Stewart’s Sophie wrestles with being human and existing in world that she believes doesn’t need her while the likes of Michael K. Williams’s Jeffrey returns to his childhood home to right the wrongs of his past through means of wealth. These are all broken people desperately seeking to find away to survive without knowing exactly how to do it. The movie avoids preaching a hard and fast moral of the story in favor of a far more ambiguous outcome. Professor Zarrow acts as a guide in his tenure as a Philosophy professor by deliveing some of the most powerful monologues I’ve seen on the big screen in years. Like every great professor, Zarrow never gives the audience an answer to the more difficult questions at hand, but rather challenges us to take them head on to make the world a very place. Sam Waterson’s performance of these lectures is moving and masterful. Each word written by Nelson oozes a passion and intelligence rarely seen even in the indie film circles. Through Zarrow, the film dares us in the audience to examine the people we pass by each and every day and wonder what their stories are. It’s moving, it’s powerful, and it works as a reminder of why I decided to start writing about movies in the first place. The ensemble cast is an impressive team of up and comers, big names, and famed character actors. Each and every one of them deliver some of the best work of their careers with the biggest standouts being Waterson, Stewart, and Freeman. Kristen Stewart turns in what should be a career defining moment in her one on one with Zarrow as she pours out the hopelessness of the heart of Sophie who struggles to defeat her nihilist ideals. Even Corey Stoll(who has become the go to guy for the role of a wealthy home wrecker) brings a level of humanism to his despicable actions that we haven’t seen before. Tim Blake Nelson has done great directorial work in the past with The Grey Zone and Leaves of Grass, but Anesthesia really takes the cake as his most personal work to date. Despite the having very ambitious goals, he quickly establishes a very down to earth tone. His script is very smart and admirable. Like the endlessly admirable professor, Nelson’s script delivers line after line with each throwing a punch the heart. Even though some of the voices seem uncharacteristically intelligent, you quickly grow to respect the worldview they each represent. These characters are all tortured by something, but the script seems to exhibit that the most beautiful part about the brokeness of these people is their desire to search for hope to make it better. Anesthesia is a rare breed of smart humanist filmmaking we don’t get to see often enough. It presents some of the inevitable issues we’re all facing in the postmodern era in a very honest light without celebrating or penalizing the responses of the characters. Like most great pieces of literature, it leaves the answers and the takeaway from the movie for us to explore in the aftermath. The lack of resolution to the themes at hand will be frustrating to some, but there’s no doubt that Tim Blake Nelson succeeded in telling the story of a group of seemingly unconnected New Yorkers as they were inspired in the wake of a tragedy.